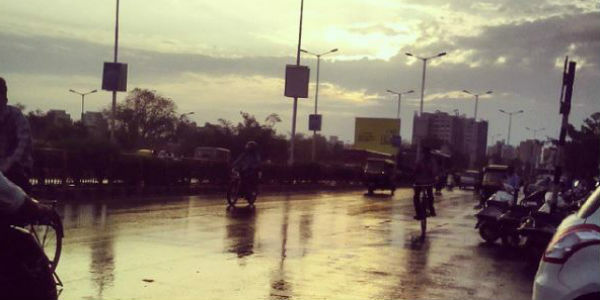 After a gap of three to four days, finally, some light rains occurred over the state of Gujarat. Though the intensity remained mostly on the lighter side. Gujarat received heavy to very heavy rains during the second and third week of July. These rains caused most areas to inundate areas like Gir, Amreli, Veraval, and Rajkot and the highly rain deficient state became rain surplus by the end of the third week of July. However, since then, the weather of the state is almost dry and clear with occasional light to moderate showers only. Due to the reduction in rains now, Saurashtra & Kutch and Gujarat regions have once again become rain deficient. As on August 9, Gujarat region is rain deficient by 17% and Saurashtra & Kutch region is 27% rain deficient. However, on the past day, scattered showers were reported over the state. In the last 24 hours, from 08:30 am on Thursday, Rajkot 5.2 mm of rains, Dwarka 2.6 mm, Veraval 2 mm, Vadodara 1.6 mm, Idar 1.5 mm, Bhuj 1.4 m, Naliya 0.6 mm, and Ahmedabad, Kandla and Okha recorded 0.2 mm of rains each. As per Skymet Weather, the axis of Monsoon trough has shifted towards the north and a cyclonic circulation can also be marked over Gujarat has also faded away. Thus, we do not expect good rains over Gujarat for the next one week. However, scattered light spells may occur over the southern districts with one or two eastern districts of Gujarat such as Vadodara, Surat, Valsad, Bhavnagar, Veraval etc. These rains would not be very heavy so as to cause floods.